A great daiquiri is a crisp and clean cocktail made with rum, lime juice and sugar. Finding balance between the rum and the lime, a daiquiri should not be sweet but rather frothy, tart and refreshing. And finding the perfect rum for your daiquiri is part of the challenge! 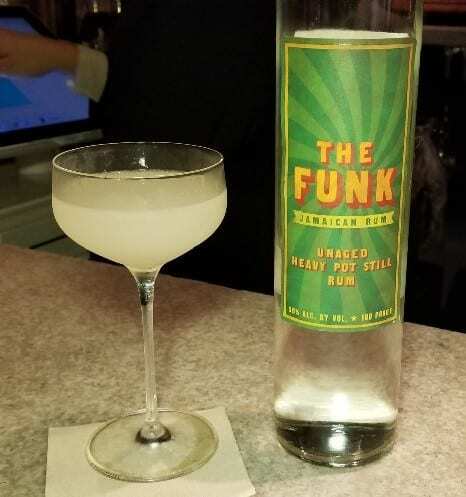 Try The Funk Rum in your daiquiri and you will understand why it is the Please The Palate pick of the week! The Funk Jamaican Rum is an un-aged heavy pot still rum with no added color or flavoring and bottled at 100 proof. The Funk Jamaican Rum is under the portfolio Proof and Wood Ventures. Two years ago, Founder and President Dave Schmier, formerly of Redemption Rye, purchased an un-aged pot still rum. Pot still rum has more intensive flavors and more esters, however, it can have an off-putting character. In fact, Dave’s warehouse manager called him up and said he had never smelled something so awful. Schmier brought the rum to 100 proof, reducing some of the intense funkiness. The result is a rum that is funky, a little bit like a stinky cheese, with tropical notes as well as ripe vegetable aromas. At the same time, the rum is approachable. The Funk Jamaican Rum is a great rum to use as a modifier in a drink or in a daiquiri, which is how I enjoyed it. And enjoy it, I did! A daiquiri made with The Funk has a lot of character. There is a slight funkiness in the nose but there is depth and roundness in the mid-palate and a citrus-tart finish. With The Funk Jamaican Rum, a refreshing, clean, classic daiquiri becomes just a bit more interesting and complex and that is why it is the Please The Palate pick of the week.